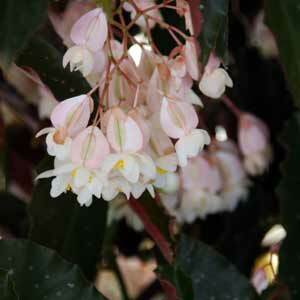 A lot of misinformation is given about these plants liking shade, they do grow well in indirect light but cane stemmed begonias are not great in deep shade, semi shade or filtered light are the best conditions for good growth and flowering. The only real problems in terms of general care is frost, and as these are a sub tropical plant they really do not handle frosts at all, however with a little protection or if grown in pots that can be moved indoors they handle a range of climates from tropical to cool temperate. These plants require plenty of filtered light, not hot direct sun, a humus rich well drained soil and that’s about it for care. Fertilize either with a general purpose slow release fertilizer, or a liquid seaweed fertilizer. In terms of pruning, cane stem begonias can be tip pruned throughout the growing season, and older canes can be cut right back and removed. They can also be hard pruned in spring if required. Propagation is easy through stem cuttings.